Featuring a versatile design, this comfortable Brenton Studio task chair makes a great addition to your home, office, dorm room or classroom. No matter where you are, an armless task chair helps you stay relaxed and productive all day long. Overall Dimensions: 38 1/4in.H x 23 1/16in.W x 26 13/16in.D. The Birklee task chair is weight capacity tested to support 250 lb. Waterfall seat cushion slopes slightly downward to help reduce stress on your legs. 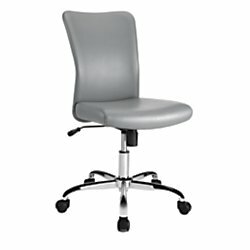 Faux leather seat offers durability and comfort. Metal and plywood frame construction provides strength. Pneumatic/1-touch mechanism lets you adjust the seat height as needed. Adjustable height range: 33 1/2in. - 38 1/4in.. Tilt adjustment lets you easily adjust the chairs tilt angle and tension. Rolling design allows you to maneuver the chair around your work area. Meets and/or exceeds ANSI/BIFMA performance standards. Assembly required. If you have any questions about this product by Brenton Studio, contact us by completing and submitting the form below. If you are looking for a specif part number, please include it with your message.